Wedding ceremonies are full of traditions that have been passed down for generations. One of the most emotional and purposeful traditions in a wedding ceremony is the moment when a proud dad leads his daughter down the aisle to her awaiting groom. This time of the occasion is so meaningful in that it represents the father giving his daughter over to her soon to be husband. There is a lot on a father’s mind during this moment; likely reminiscing about all of the memories with his little girl that led up to this big day. Father’s are lucky to have this very important job of making sure the bride makes it to the front of the church, no matter how shaky or nervous she may be beforehand. I really admire this shot of the dad and his daughter making their way between the pews of the church as guests smile and capture photos. This long, gorgeous veil was a lovely statement piece to complete the style of the bride’s dress, trailing along the floor gracefully behind her. 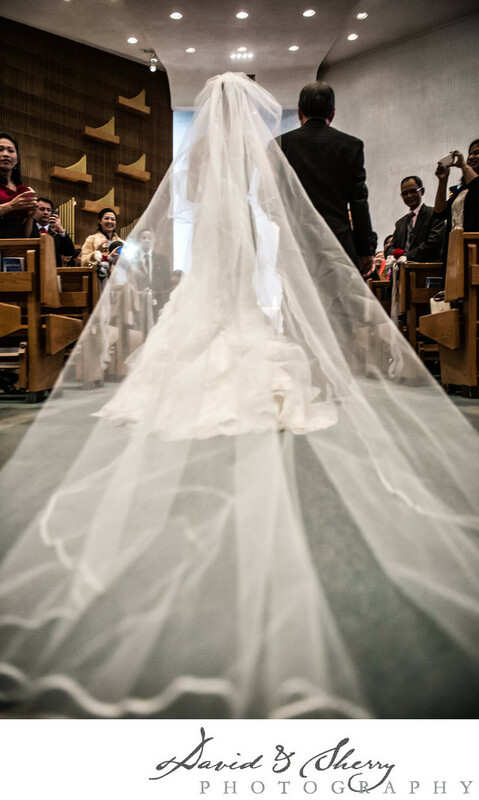 I love photographing the classic look of a cathedral veil. This elegant bridal trend never seems to go out of style no matter how many years go by.